Age Limit: Between 18-27 years as on 27.03.2014. Upper age limit for SC/ST/OBC/PWD/Ex-Servicemen has been relaxed as per central govt rules. Salary for PA/SA posts is Rs. 18000 including DA, HRA etc. Educational Qualification: Applicants must have passed 10+2 level or 12th standard exam from a recognized board/university/organization. Language Proficiency: Candidates should have proficiency in local language of the State/ UT of the concerned postal circle and studied same language in board exam or studied Hindi in matriculation or equivalent exam. Candidates should have to apply through online mode. The link of online registration will be started from 26.02.2014. Last Date of Online Application- 27.03.2014. Please Note: All the 22 postal circles will publish recruitment notification individually. Whenever the official advertisement will be released, we will publish here. Keep checking our website for further updates. 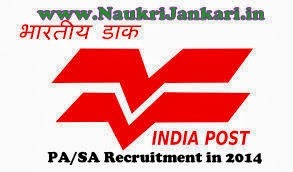 0 comments for " India Post PA/SA Recruitment 2014 in 22 Postal Circles "